Years ago when I first began doing serious research to try and understand what was happening to this country, many times I felt as if I'd somehow been transported into the Twilight Zone to a parallel universe. Everything was familiar on the outside, but what I was reading on the Internet about the social and political landscape was completely different from my understanding of the world as I had known it. The cognitive dissonance was almost overwhelming. Had I been a different type of person, I might have turned off my machine forever to avoid the horror of the vision that I was getting. Instead, I set about the task - which has turned out to be a mission - of trying to reconcile the discrepancies between what I thought was true - and what I was seeing was actually true. Of course, I'm not alone in my quest. Innumerable people on the Internet are doing the same thing I'm doing and every once in a while, I encounter something that one of them has written that so completely encapsulates my thoughts that it becomes a signature concept. Such is the case with an article titled 'State of the World Forum" by Ken Raggio. "From 1981 until his appointment as U.S. secretary of state, Shultz was chairman of President Reagan's Economic Policy Advisory Board. He became secretary of the Treasury in May 1972, serving until May 1974. During that period he also served as chairman of the Council on Economic Policy. As chairman of the East-West Trade Policy Committee, Shultz traveled to Moscow in 1973 and negotiated a series of trade protocols with the Soviet Union. He also represented the United States at the Tokyo meeting on the General Agreement on Tariffs and Trade." The Conference on Security and Co-operation in Europe (CSCE) began in 1973 and the agreed upon framework of actions for reunification was codified in the Helsinki Final Act. The major countries to sign the agreement were the Soviet Union, East and West Germany, U.S. and Canada. The agreement was signed in 1975 by President Gerald R. Ford. The cooperation called for in the agreement pertained specifically to economic (trade) and domestic policy. In effect, the 'cooperation' really meant the open importation of communist ideology to America. The route of infiltration and indoctrination was under the cover of "research" and "cultural exchange". The result has been the transformation of the United States to a communist system of "governance" and all that comes with it - including the loss of private property rights, the citizen surveillance and control systems, the conversion of our schools to the Soviet model of indoctrination and vocational (non-education), erosion of power by elected officials through regionalization - management by unelected, invisible operatives of the Comintern. A key to understanding how this happened is to look at the "Helsinki Process" which was the first order of business for Helsinki negotiating teams. Summarizing, the way the Process works is that the Foreign Ministers meet to agree on the agenda. That's stage 1. Stage 2, committees comprised of people from the different countries work out the details for the implementation of the agenda items. Stage 3, the Foreign Ministers meet to sign agreement on the implementation of the agenda. This methodology divorces the leaders from the details of agreements. The "Helsinki Process" should be called the "Puppet Process" because it turns leaders into mere puppets of the committees below. No doubt "leaders" are given carefully worded bullet points (talking points) on the decisions made at the lower committee level. The "Helsinki Process" puts the real power at the second or third level down which provides cover for the operatives of the network. If the agenda is exposed, the leader is taken out but the real power structure remains in place. The Helsinki Process in the form of Fast Track trade Authority has been the way that the U.S. economy has been gutted. The Orwellian label of "free trade" became the mantra - and it was used to undercut U.S. businesses by flooding our markets with cheap imports - forcing American business to either go out of business or leave the country. In the Uruguay Round of trade talks that were negotiated with Fast Track Authority, 'Trade in Services' was included. 'Services' equates to jobs and people so in effect, that was the set up for the export of jobs and the import of cheap labor to displace the American people from their economic livelihoods - crushing the middle class economically - and depriving the U.S. government of the tax base causing the deficits and economic collapse of our nation. xxxxxxx ... In the late 1970's America became committed to the process of monitoring the Helsinki accords, especially that "basket" dealing with human rights. In 1978 Congressmen Fascell and Donald Fraser (D,MN) proposed a "QUANGO" (i.e, quasi-autonomous non-governmental organization) whose mission would be the advancement of human rights. The bill they introduced would have created an Institute for Human Rights and Freedom to furnish technical and financial assistance to nongovernmental organizations that promote human rights abroad. ... By the late 70's, there was an important model for democracy assistance: the German Federal Republic's party foundations, created after World War II to help rebuild Germany's democratic institutions destroyed a generation earlier by the Nazis. These foundations (known as "Stiftungen"), each aligned with one of the four German political parties, received funding from the West German treasury. In the 1960's they began assisting their ideological counterparts abroad, and by the mid-70's were playing an important role in both of the democratic transitions taking place on the Iberian Peninsula. Late in 1977, Washington political consultant George Agree, citing the important work being carried out by the Stiftungen, proposed creation of a foundation to promote communication and understanding between the two major U.S. political parties and other parties around the world. Headed by U.S. Trade Representative William Brock, a former Republican National Committee Chairman, and Charles Manatt, then serving as Democratic National Committee Chairman, by 1980 the American Political Foundation had established an office in Washington, D.C. from which it provided briefings, appointments, and other assistance to foreign party, parliamentary, and academic visitors to the U.S.
Two years later, in one of his major foreign policy addresses, President Reagan proposed an initiative "to foster the infrastructure of democracy--the system of a free press, unions, political parties, universities--which allows a people to choose their own way, to develop their own culture, to reconcile their own differences through peaceful means." He noted that the American Political Foundation would soon begin a study "to determine how the U.S. can best contribute--as a nation--to the global campaign for democracy now gathering force." Delivered to a packed Parliamentary chamber in Britain's Westminster Palace, the Reagan speech would prove to be one of the central contributions to the establishment of a U.S. democracy foundation. The American Political Foundation's study was funded by a $300,000 grant from the Agency for International Development(AID) and it became known as "The Democracy Program." Its executive board consisted of a broad cross-section of participants in American politics and foreign policy making. The Democracy Program recommended establishment of a bipartisan, private, non-profit corporation to be known as the National Endowment for Democracy (NED). In 1985, George Shultz negotiated and signed an annex document to the Helsinki Final Act after a summit in Geneva calling for exchange of intellectuals and students. Another agreement was signed in 1988 after a summit in Moscow. 1985 - General Agreement On Contacts, Exchanges, and Cooperation in Scientific, Technical, Educational and Cultural and Other Fields. 1988 - Program of Cooperation and Exchanges Between The United States of America and the Union of Soviet Socialist Republics for 1989-1991. 3. The Parties will encourage the exchange of school textbooks and other teaching materials, and, as is deemed appropriate, the conducting of joint studies on textbooks, between the State Committee for Public Education of the Union of Soviet Socialist Republics and appropriate organizations in the United States of America. The Parties will encourage the work of analyzing the school textbooks of both countries in history and geography. 7. The Parties will encourage the development of contacts between the Academy of Pedagogical Sciences of the Union of Soviet Socialist Republics and appropriate institutions in the United States of America in the fields of pedagogy and educational psychology. During the time in which this Program is in force, the Parties, taking into consideration their mutual interest as well as financial and technical conditions, will conduct negotiations on the opening of culture - information centers in the United States of America and the Union of Soviet Socialist Republics with the aim of signing an appropriate agreement on behalf of the Governments of both countries. Charlotte Iserbyt worked for the U.S. Department of Education when the 1985 agreement was signed. She's made heroic efforts ever since trying to blow the whistle on this treason even to the point of raising the money for an advertisement page in the Washington Times because the Newspapers wouldn't cover the story. In 1997, Iserbyt published a pamphlet titled, "Soviets in the Classroom: America's Latest Educational Fad". In 1999, Iserbyt published a book containing all of the information she'd collected over the years on the 'transformation' taking place in our public schools that she titled, "The Deliberate Dumbing Down of America". This book should be required reading for all Americans - parents and taxpayers. If they did read it, they wouldn't contribute another dime to the current education system - you can't even call it education - it's indoctrination to communism for the emerging Union of Soviet Socialist American States. "What we're into is the total restructuring of society. What is happening in America today and what is happening in Kansas and the Great Plains is not simply a chance situation in the usual winds of change. What it amounts to is a total transformation of society...Our total society is in a crisis of restructuring and you can't get away from it. You can't go into rural areas, you can't go into churches, you can't go into government or into business and hide from the fact that what we are facing is the total restructuring of society". The exchange programs negotiated by George Shultz included sending missionaries for representative democracy to COMMUNIST countries and importing COMMUNISTS to the United States. Put yourself in the mind of a Soviet (COMMUNIST) strategist for a moment. In other words, put yourself in the mind of George Shultz. Your goal is restructure and transform America to be a COMMUNIST country. How would you do that? First, you would need some kind of 'shock to society' because big changes only come after some kind of shock to the system (Shock doctrine page 17). The 'shock to the system' was the attempted August Coup in the Soviet Union which by the hindsight of history and the information provided by KGB defector Anatoly Golitsyn, we know was a fake. But it did provide a reason for Gorbachev to require a new domicile and to be hailed as a hero of reform worldwide. More importantly, it provided a plausible reason for him to be invited here to the United States. According to the official mythology, the alleged coup was due to the economic and cultural reforms brought in by Gorbachev. The result was that Gorbachev resigned as leader of the Soviet Union and he was invited to establish "an information center" here in the United States. "The founding documents of the Tamalpais Institute, established as a "Not-for-Profit" entity in the State of California on 10th April 1991, were signed by Dr. Jim Garrison and one Amy Vossbrinck. Dr. Garrison had a long prehistory of visits to the Soviet Union in the years when free-and-easy access there was impossible other than to favoured operatives. On 10th April 1992, the Tamalpais Institute filed revised documents changing its name to Gorbachev Foundation/USA. We need to know why this entity, operating relentlessly on behalf of the Soviet Party-intelligence structures to expand a flabby constituency campaigning for "global governance" and to "definitively impose" a dead "New Age" mentality on the international community has a Virginia-based publicist. Of special relevance is the fact that the shell of the Gorbachev Foundation, out of which sprang the WORLD STATE FORUM, was founded on April 10, 1991 -- over four months prior to the KGB's controlled "August Coup". AT that time, only Soviet intelligence and in-the-know Party strategists would have been aware of the course to be taken by "collapsible Communism." The Soviet Analyst was wrong about only the KGB knowing. People in our government knew - and in particular, George Shultz knew because he was the negotiator for the Helsinki Final Act and he was the Secretary of State when the 1985 and 1988 "cooperation" agreements with the Soviets were signed and as shown above, Article VI provided for cultural 'Information Centers'. When Shultz left government service in 1989, he went to the Hoover Institution at Stanford. He is the Thomas W. and Susan B. Ford Distinguished Fellow at Hoover. It wouldn't be a stretch to think that the arrangements for the Gorbachev Foundation were made at that time of Gorbachev's 1990 visit. Recent statements by James Garrison, co-founder and president of the Gorbachev Foundation/USA, for instance, must have caused Mr. Cranston to wince. "Over the next 20 to 30 years, we are going to end up with world government," Garrison said in an interview in the May 31-June 6, 1995 issue of SF Weekly, a liberal-left San Francisco newspaper. "It's inevitable." Garrison continued: "What's happening right now as you break down the Cold War, what is emerging now is ethnic identities. You are going to see more Yugoslavias, more Somalias, more Rwandas, more [Timothy] McVeighs and more nerve-gas attacks. But in and through this turbulence is the recognition that we have to empower the United Nations and that we have to govern and regulate human interaction...."
In his book Perestroika, he plainly admitted: "We are not going to change Soviet power, of course, or abandon its fundamental principles, but we acknowledge the need for changes that will strengthen socialism." In the same revered text he explained that "according to Lenin, socialism and democracy are indivisible," and the "essence of perestroika lies in the fact that it unites socialism with democracy and revives the Leninist concept of socialist construction both in theory and in practice." (Emphasis added.) Thus, when he declares for "democracy," he means "democracy" within the Leninist conception and definition of the term, something quite the opposite of that which most Americans assume he is talking about. But this dialectical legerdemain does not concern George Shultz, who introduced the royal eminence with an embarrassing gush of superlatives ("brilliant," "bold," "daring," "imaginative," "astonishing energy and intellectual grasp," "an intellect of the highest order") and anecdotes of their long "friendship." 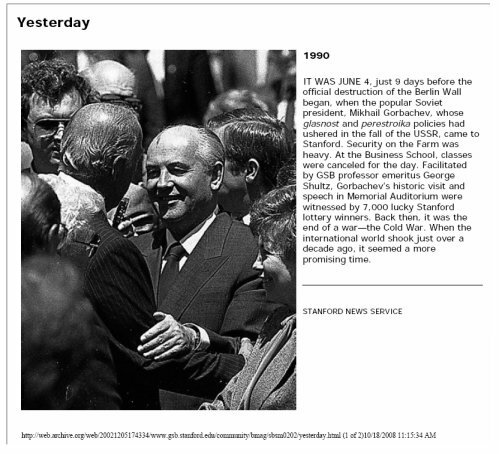 Shultz, a member and former director of the Council on Foreign Relations, and Gorbachev go back a long way together. In 1985 the duo signed the Soviet-American Education Exchange Agreement negotiated by the one-world subversives at the Carnegie Corporation. Shultz spoke with fond remembrance to the forum guests of the "historic" 1986 Reykjavik Summit at which he and President Reagan, together with Gorbachev and Eduard Shevardnadze, laid the groundwork for the INF Treaty and other disarmament debacles. "Without exaggeration, it is certainly the most desirable chunk of undeveloped urban real estate in the country. It is a city on the edge of the city of San Francisco, and one lost in time. Pass through at night as fog creeps in from the Golden Gate; in much of the Presidio, the mature forest of pine, cypress and fragrant eucalyptus shelter it from noise and glare of the modern world, and it is easy to imagine that it could be one hundred, two hundred years ago. It is a place without compare. It is such a prize that many were astonished when the U.S. military announced in 1989 that it would surrender without a fight and decommission its historic showcase army base. By prior legislation, the Presidio would now become a national park." "According to the History section of the Presidio Trust: "As the Cold War drew to a close, the federal government reexamined the nation’s defense needs, and in 1989 decided to close the Presidio. In October 1994, the U.S. Army lowered its flag for the last time, and the Presidio was transferred to the National Park Service as part of the Golden Gate National Recreation Area."